Now, more that five years later, we know this [disruption of universities] is not the case. I started Class Central at the end of Nov 2011 as a side project to keep track of free online courses, so I’ve followed the space closely right from the beginning. MOOC providers have learned a lot in the last five years, and they’re now more certain about who their real audience is—and they’re not the dabblers and lifelong learners who take courses just for curiosity’s sake. Traditional lifelong learners might learn due to their love of learning, but in the case of lifelong career learners, the “lifelong” part is driven by the necessity of constantly adapting to the changing job market. Learning for the sake of learning sounds appealing, but, at least anecdotally, I hear from many people find they are more likely to make significant progress or even complete a course when they are tied to professional outcomes (that’s certainly my experience). Typical paid programs lead to certificates and may be sponsored by the employer and may be tied to a monthly subscription. 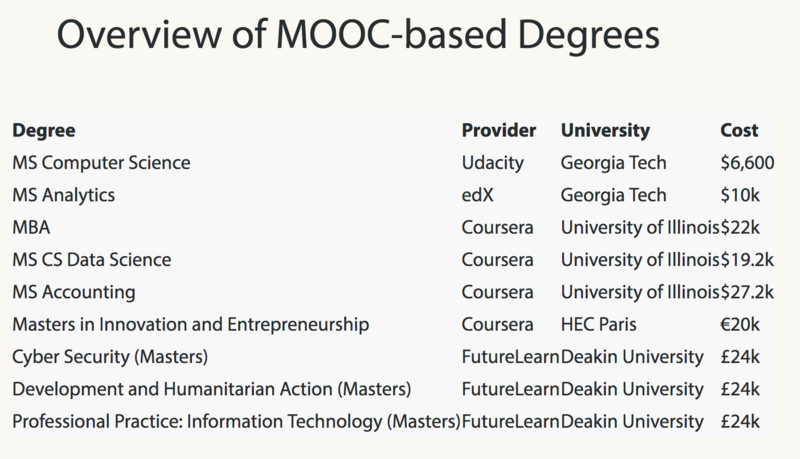 But if you are true lifelong learner—the ones that helped start all the hype in the first place—the MOOC experience has largely been reduced to basically a YouTube playlist with a cumbersome user interface. Unless, of course, you are willing to pay. The OPM market is interesting and dynamic. Here we see strong arguments for both bundled revenue-sharing models and for unbundled fee-for-service models. I personally do not believe that the market is moving away from revenue sharing as much as there is pressure for additional models. There are a growing number of choices available to schools, but there is also a crowded marketplace that is becoming more difficult to understand and compare vendors. The 10 programs mentioned above now represent one of these "additional models" in the crowded marketplace. For those wanting to understand where the large, commercial MOOC market stands in 2017, I recommend reading both of Dhawal Shah's posts - from April at Class Central and July at EdSurge.